Abd Jalil, N., Saufi Awang, M., & Omar, M. (2010). Scalene Myofascial Pain Syndrome Mimicking Cervical Disc Prolapse: A Report of Two Cases. Malays J Med Sci, 17(1), 60-66. Alexander, E. P. (2011). History, Physical Examination, and Differential Diagnosis of Neck Pain. Phys Med Rehabil Clin N Am, 22, 383-393. Alnaami, I., Siddiqui, M., & Saqqur, M. (2012). The Diagnosis of Vertebrobasilar Insufficiency Using Transcranial Doppler Ultrasound. Case Reports in Medicine. Ardeshiri, A., Chen, B., Hütter, B.O., et al. (2013). Intramedullary spinal cord astrocytomas: The influence of localization and tumor extension on resectability and functional outcome. Acta Neurochir (Wien).155(7), 1203-7. Bakers, R., Nasypany, A., Seegmiller, J., & Baker, J. (2013). Treatment of Acute Torticollis Using Positional Release Therapy: Part 1. International Journal Of Athletic Therapy & Training, 18(2), 34-37. Binder, A. (2007). The diagnosis and treatment of nonspecific neck pain and whiplash. Europa Medicophysica, 43(1), 79-89. Bohlman, H.H., Sachs, B.L., Carter, J.R., Riley, L., & Robinson, R.A. (1986). Primary neoplasms of the cervical spine. Diagnosis and treatment of twenty-three patients. J Bone Joint Surg Am., 68(4), 483-494. Childs, J. D., Cleland, J. A., Elliott, J. M., Teyhen, D. S., Wainner, R. S., Whitman, J. M., & Sopky, B. J. (2008). Neck Pain Clinical Practice Guidelines. J Orthop Sports Phys Ther, 38(9), A1-A34. Cook, C., Brismee, J., Fleming, R., & Sizer Jr., P. S. (2005). Identifiers Suggestive of Clinical Cervical Spine Instability: A Delphi Study. Physical Therapy, 85(9), 895-906. Dressendorfer, R. (2012). Cervical Strain and Sprain. Clinical Review. Dressendorfer, R. (2012). Neck Pain, Chronic: Idiopathic. Clinical Review. Elvey, R., Brachial plexus tension tests and the pathoanatomical origin of arm pain, in Aspects of manipulative therapy, E. Glasgow, et al., Editors. 1985, Churchill Livingstone: Melbourne. p.116-122. Eubanks, J. D. (2010, January 1). Cervical Radioculopathy. American Family Physician, 81(1). Retrieved June 26, 2013, from CINHAL. Fish, D. E., Gerstman, B. A., & Lin, V. (2011). Evaluation of the Patient with Neck Versus Shoulder Pain. Phys Med Rehabil Clin N Am, 22, 395-410. Fitzgerald, G. (2012). Thoracic outlet syndrome of pectoralis minor etiology mimicking cardiac symptoms on activity: a case report. J Can Chiropr Assoc., 56(4), 311-315. Gellhorn, A. C., Katz, J. N., & Suri, P. (2012). Osteoarthritis of the spine: the facet joints. In Nat. Rev. Rheumatol. Advance Online Publication. Granado, M. J., & Palmer, E. (2012). Radiculopathy, Cervical. Clinical Review. Gu, R., Kang, M. Y., Gao, Z. L., Zhao, J. W., & Wang, J. C. (2012). Differential diagnosis of cervical radiculopathy and superior pulmonary sulcus tumor. Chin Med J., 125(15), 2755-2757. Hadley, M.N. (1994). Renal osteodystrophy of the cervical spine: neurosurgical implications. Neurosurgery, 34(2), 381-382. Horn, K., et al., (2012). The Patient-Specific Functional Scale: psychometrics, clinimetrics, and application as a clinical outcome measure. Journal of Orthopaedic and Sports Physical Therapy, 2012. 42, 30-42. Hutting, N., Verhagen, A. P., Vijverman, V., Keesenberg, M., Dixon, G., & Scholten-Peeters, G. (2013). Diagnostic accuracy of pre-manipulative vertebrobasilar insufficiency tests: A systematic review. Manual Therapy, 18(3), 177-182. Lee, D.H., Kim, N.H., Hwang, C.J., et al. (2011). Neglected esophageal perforation after upper thoracic vertebral fracture. Spine J., 11(12), 1146-1151. Mitchell, J., Keene, D., Dyson, C., Harvey, L., Pruvey, C., & Phillips, R. (2004). Is Cervical Spine Rotation, as used in the standard vertebrobasilar insufficiency test, associated with a measurable change in intracranial vertebral artery blood flow? Man Ther, 9(4), 220-227. Musculoskeletal physiotherapists' perceptions of non-responsiveness to treatment for cervicogenic headache. Physiotherapy Theory and Practice, 0(0), 1-14. Schneider, D.F., Chen, H., (2013). New developments in the diagnosis and treatment of thyroid cancer. CA Cancer J Clin. Sweeney, A., & Doody, C. (2010). The clinical reasoning of musculoskeletal physiotherapists in relation to the assessment of vertebrobasilar insufficiency: A qualitative study. Manual Therapy, 15(4), 394-399. Swinkels, R., Beeton, K., & Alltree, J. (1996). Pathogenesis of upper cervical instability. Manual Therapy, 1, 127-132. Tan, W., Egyhazi, R., & Issac, Z. (2012). C6 Radiculopathy: The Initial Presentation of Fribromuscular Dysplasia. PM&R, 4(7), 527-529. Watson, D. H., & Drummond, P. D. (2012). Head Pain Referral During Examination of the Neck in Migraine and Tension-Type Headache. Headache: The Journal of Head and Face Pain, 52(8), 1226-1235. Westaway, M., Stratford, P., & Binkley, J. (1998). The patient-specific functional scale: validation of its use in persons with neck dysfunction. Journal of Orthopaedic and Sports Physical Therapy, 27(5), 331-338. Williams, L. (2012). 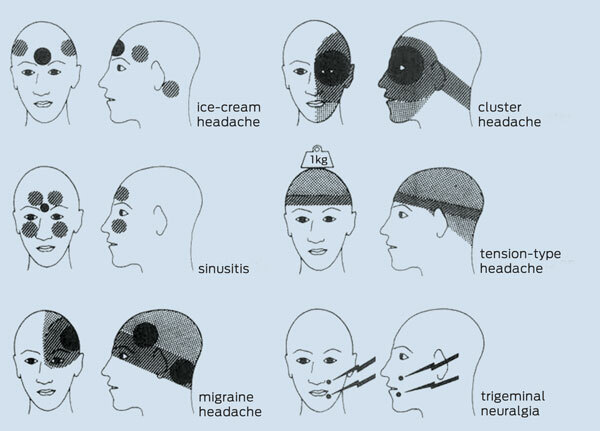 A Concise Discussion of Headache Types, Part 1. International Journal Of Pharmaceutical Compounding, 16(2), 125-132. Yu, J., Zhao, D. D., Chen, S., Zhang, J. M., & Xu, J. (2012). Primary melanoma of the cervical spine with cerebral metastases: Case report and review of the literature. J Int Med Res., 40(3), 1207-1215. Yung, E., Asayasopon, S., & Godges, J. J. (2010). Screening for Head, Neck, and Shoulder Pathology in Patients with Upper Extremity Signs and Symptoms. Journal of Hand Therapy, 23(2), 173-186. Arteriosclerosis / atherosclerosis. Mayo Clinic, 27 June 2012. Web. 27 June 2013. Dutton, M. (2008). Orthopaedic Examination, Evaluation, and Intervention (2nd ed., pp. 1346-1347). Pittsburg, PA: McGraw-Hill. Goodman, C. C., & Snyder, T. E. (2007). Differential Diagnosis for Physical Therapists Screening for Referral. St. Louis, MO: Saunders Elsevier. Meadows, J., (1999). Orthopedic Differential Diagnosis in Physical Therapy: A Case Study Approach (pp. 122-123). New York, NY: McGraw-Hill. Anatomy Pictures were obtained from: Google, Inc.